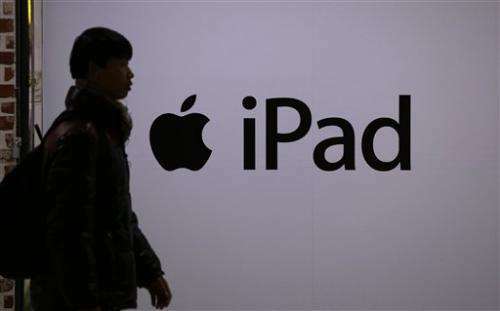 A Seoul court rejected Samsung's claim that iPhone and iPad models violated three of its patents, another setback for the South Korean electronics giant in a global battle with Apple over rights to technologies that power smartphones and tablets. A Seoul Central District Court judge ruled Thursday that Apple did not violate Samsung's intellectual property rights. The technology in two of Samsung's patents could be developed easily from other inventions, Judge Shim Woo-yong said, making it unlikely they were copied. He said one patent was not used in the iPad. "We are glad the Korean court joined others around the world in standing up for real innovation and rejecting Samsung's ridiculous claims," Apple Inc. spokesman Steve Park said. Samsung Electronics Co. sued Apple in March 2012, accusing the iPhone maker of illegally using three patented technologies related to short message services in smartphones and tablet computers. The maker of Galaxy smartphones sought 100 million won ($95,000) in initial compensation and a ban on sales of six iPhone and iPad models, which included models still available in the market, such as those with Retina display. The judge said Samsung's patent for a multitasking technology that prevents incomplete messages being lost when switching to another application was not violated by the existence of a similar technology. Another technology that enables users to touch a notification box to access a message can be invented easily, he said. A third Samsung patent for how mobile devices display short messages from the same sender together was not used in Apple's iPad, which instead has Apple's iMessage application, Shim said. The ruling is the latest legal blow to Samsung, which owes Apple $930 million from two jury verdicts in Silicon Valley. Samsung is seeking to appeal both. In 2012, another judge at the same Seoul court punished both Apple and Samsung for violating each other's intellectual property rights. The world's top two smartphone makers have waged legal battles over mobile devices since 2011. Samsung said it was disappointed by the ruling and will decide whether to appeal this decision after a thorough review. "As Apple has continued to infringe our patented mobile technologies, we will continue to take the measures necessary to protect our intellectual property rights," it said in a statement. So far, two verdicts in Silicon Valley have been the most damaging to the South Korean company. Last month, a Silicon Valley jury added another $290 million to the damages Samsung Electronics owes Apple. A previous jury awarded Apple $1.05 billion, which was later reduced by a judge to $640 million. But the size of the award is small compared with the size of Samsung Electronics, the world's largest maker of mobile devices, TVs and memory chips. The South Korean firm reported it had $47 billion in cash at the end of September and $247.5 billion in 2012 revenue.